This is not to say that many do not remain cautious about the prospects for political change – just 41% say that a free and fair choice in the next election is very likely, while as many (43%) think it is only somewhat likely, and 16% say it is unlikely. In this new political era, Egyptians are embracing long-standing bases of power, and new ones, as well. The military and its leadership are very well regarded, and the Egyptian public is clearly open to religion-based political parties being part of a future government. Most have a favorable opinion of the Muslim Brotherhood, and looking ahead to the elections, it has as much potential support as any of a number of political parties. But other agents of political change are also viewed positively by majorities of Egyptians, including the relatively secular April 6 Movement and political leaders Amr Moussa, Ayman Nour, and Mohamed ElBaradei. No dividend emerges for the United States from the political changes that have occurred in Egypt. Favorable ratings of the U.S. remain as low as they have been in recent years, and many Egyptians say they want a less close relationship with America. Israel fares even more poorly. By a 54%-to-36% margin, Egyptians want the peace treaty with that country annulled. These are the principal findings from a nationwide survey of Egypt by the Pew Research Center’s Global Attitudes Project. Face-to-face interviews were conducted with 1,000 adults in Egypt between March 24 and April 7, 2011. The poll finds Egyptians anxious for democracy and accountable government. When they are asked what has concerned them most about Egypt in recent years, corruption and a lack of democracy top the list. And support for democracy is clearly on the rise in Egypt. 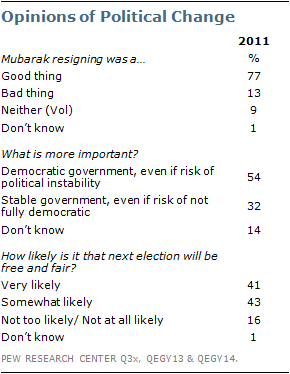 Last year, 60% of Egyptians said that democracy is preferable to any other type of government; today, 71% hold this view. By a 64%-to-34% majority, most say they favor a democratic form of government over a strong leader. Four years ago the public was evenly divided on this basic question about governance. Moreover, 62% want parliamentary and presidential elections as soon as possible, rather than delaying them to give political parties more time to organize. Yet, the poll finds that the desire for free multiparty elections co-exists, and potentially competes with, other aspirations. More Egyptians say that improved economic conditions (82%) and a fair judiciary (79%) are very important than say that about honest, multiparty elections (55%). And maintaining law and order is also more highly rated (63%). In that regard, when asked to choose which is more important – a democratic government, even if there is some risk of political instability, or a stable government that is not fully democratic – democracy wins out, but by a narrow 54%-majority; 32% choose stability, and as many as 14% of Egyptians say they are not sure. When a good democracy is tested against a strong economy, it is a 47%-to-49% draw, respectively. Regarding economic conditions, the survey finds Egyptians somewhat more positive than they were a year ago. About one-third (34%) now rate the economy as good, compared with 20% in 2010; still, most (64%) say economic conditions are bad. But fully 56% think the economy will improve over the next year. Just 25% were optimistic in 2010. The military is now almost universally seen (88%) as having a good influence on the way things are going in Egypt. Fully 90% rate military chief Mohamed Tantawi favorably. In contrast, views of the police are on balance negative (39% good influence, 61% bad influence). The court system and religious leaders are seen by most as having a good influence on the country, 67% and 81% respectively, but it is of note that fewer Egyptians give religious leaders very good ratings this year than did so in 2007 (29% vs. 43%). Most see the traditional news media’s influence as having a positive impact on the way things are going, and the survey found as many as 23% saying they use social networking sites to get news and information about the political situation in Egypt. Egyptians are welcoming some forms of change more than others. While half say it is very important that religious parties be allowed to be part of the government, only 27% give a similar priority to assuring that the military falls under civilian control. Relatively few (39%) give high priority to women having the same rights as men. Women themselves are more likely to say it is very important that they are assured equal rights than are men (48% vs. 30%). Overall, just 36% think it is very important that Coptic Christians and other religious minorities are able to freely practice their religions. Egyptians hold diverse views about religion. About six-in-ten (62%) think laws should strictly follow the teachings of the Quran. However, only 31% of Egyptian Muslims say they sympathize with Islamic fundamentalists, while nearly the same number (30%) say they sympathize with those who disagree with the fundamentalists, and 26% have mixed views on this question. Those who disagree with fundamentalists are almost evenly divided on whether the treaty with Israel should be annulled, while others favor ending the pact by a goodly margin. Only 20% of Egyptians hold a favorable opinion of the United States, which is nearly identical to the 17% who rated it favorably in 2010. Better educated and younger Egyptians have a slightly more positive attitude toward the U.S. than do other Egyptians. Ratings for U.S. President Barack Obama are also basically unchanged from last year – currently, 35% of Egyptians express confidence in Obama to do the right thing in world affairs, compared with 33% in 2010. The American president gets more negative than positive reviews for how he is handling the political changes sweeping through the Middle East: 52% disapprove of how Obama is dealing with the calls for political change in nations such as Egypt, Tunisia, Bahrain, and Libya. A plurality of those who disapprove say Obama has shown too little support for those who are calling for change. When asked specifically about the U.S. response to the political situation in Egypt, 39% say the U.S. has had a negative impact, while just 22% say it has had a positive effect, and 35% volunteer that the U.S. has neither positively nor negatively influenced the situation in their country. Looking to the future, few Egyptians (15%) want closer ties with the U.S., while 43% would prefer a more distant relationship, and 40% would like the relationship between the two countries to remain about as close as it has been in recent years.